A common economic development tool that can defer property taxes on certain improvements to real property in a reinvestment zone designated for economic development purposes. The City of Azle will, on a case-by-case basis, give consideration to providing tax abatement on a portion of real and personal property as stimulation for economic development for industrial, manufacturing, distribution and service facilities subject to the qualifications, conditions and requirements to be fully described within an agreement and subject to the approval of the Azle City Council. Companies in Tarrant and Parker Counties that ship certain products in and out of the State of Texas can realize substantial savings in taxes with this exemption by exempting some of a company’s inventory from city and county property taxes. To be eligible, property must be assembled, stored, manufactured or fabricated locally and then exported out of the state within 175 days after the property was acquired or imported into the state. The goods do not include oil, gas or petroleum products or special inventories such as motor vehicles or boats in a dealer’s retail inventory. For companies with high-value inventories, the double Freeport Exemption can have a greater incentive value than tax abatement. A free program for City of Azle business property owners or tenants seeking to renovate or restore their exterior signage, awnings, lighting, or commercial building façade. Chapter 380 of the State of Texas Local Government Code allows municipalities to making loans and grants to stimulate business and commercial activity in the City. The City of Azle is open to consideration of Chapter 380 agreements. 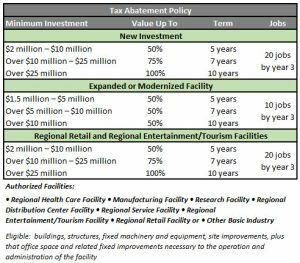 The City of Azle has formed the Tax Increment Financing Reinvestment Zone #1 to facilitate development and encourage private investment while establishing high development standards within the city. TIRZ #1 covers approximately 1,039 acres and is located in the heart of the City of Azle near the intersection of FM 730 and TX 199. The TIRZ Board will consider using the TIRZ to finance needed public infrastructure improvements in the Zone. Improvements can be paid for by the TIRZ then repaid by the taxes generated by the development, or could be paid upfront by a developer, then repaid to the developer through taxes generated by the developer. The Texas Enterprise Fund (TEF), the largest “deal-closing” fund of its kind in the nation, continues to attract businesses and jobs to Texas. The TEF can be used for a variety of economic development projects, including infrastructure development, community development, job training programs and business incentives. Projects that are considered for the Enterprise Fund support must demonstrate a project’s worthiness, maximize the benefits to the State of Texas and realize a significant rate of return of the public dollars being used for the economic development of Texas. Capital investment, job creation, wages generated, financial strength of the applicant, applicant’s business history, analysis of the relevant business sector, and federal and local government and private sector financial support of a project will all be significant factors in approving the use of the Enterprise Fund. The Skills Development Fund is Texas’ premier job-training program providing local customized training opportunities for Texas businesses and workers to increase skill levels and wages of the Texas workforce. The Texas Workforce Commission administers funding for the program. Success is achieved through collaboration among businesses, public community and technical colleges, Workforce Development Boards and economic development partners. Not to be confused with the Texas Enterprise Fund. Projects are eligible to apply for state sales and use tax refunds on qualified expenditures. The level and amount of refund is related to the capital investment and jobs created at the qualified business site. The Enterprise Zone Program is administered through the Office of the Governor, Economic Development Bank. The City of Azle Economic Development will file the TEZP application and complete some of the application requirements and the Project will provide information as needed. A program that allows employees—and those employees’ family members—of a qualified business considering a relocation or expansion of its operations in the State of Texas to pay in-state tuition rates at public institutions of higher education in the state without first establishing residency. EMCID may apply on behalf of the business, so long as the business is still in the decision-making process to relocate or expand its operations at the applicable site. The incentive lasts for a period of 5 years after the qualified business becomes established as part of the state’s Economic Development and Diversification Program. This exceptional opportunity supports businesses with fewer than 100 employees and emphasizes training for new workers though it also may help upgrade the skills of incumbent workers. Small businesses can apply to Texas Workforce Commission (TWC) for training offered by their local community or technical college, or the Texas Engineering Extension Service (TEEX). Administered through the Texas Workforce Commission, up to $2 million from the Skills Development Fund is dedicated to Texas employers. All private businesses, including private, nonprofit hospitals, can apply to Texas Workforce Commission TWC for training offered by their local community or technical college, or the Texas Engineering Extension Service (TEEX), to upgrade the skills of newly hired veterans. All private businesses, including private, nonprofit hospitals, can apply to TWC for training offered by their local community or technical college, or the Texas Engineering Extension Service (TEEX), to upgrade the skills of newly hired veterans. A partnership between the State of Texas and selected non-profit lenders to increase access to financing for small and medium-sized businesses and non-profits facing barriers to accessing capital or fall outside of guidelines of conventional lending. The Program facilitates loans which are underwritten by the participating non-profit lenders and supported by the state contributions to a loan loss reserve fund. Loans may be used for working capital or the purchase, construction or lease of capital assets, to include buildings and equipment. TMAC is an affiliate of the Manufacturing Extension Partnership (MEP) program of National Institute of Standards and Technology (NIST). TMAC delivers hands-on business management, technology and operations solutions to a wide range of businesses, including manufacturing, distribution, logistics, construction, health care and government. We have a wide array of services that accelerate profitable growth by developing and improving products, processes and people. Focus areas include Strategic Management, Technology and Operations. Please note that incentives are not offered for every project. Incentives typically require approval from one or more boards or commissions and are subject to final approval by City Council. The City of Azle will work with each applicant to determine the specific needs of the applicant and tailor an incentive package to meet that company’s particular needs.